Recommended Reading: A new book by Laura Reeves, and a revised edition of the classic Lifecycle Toolkit. If you've been to any of my classes, you already know that I am a fan of Laura Reeves. She has a pragmatic, get-things-done approach to data warehousing. 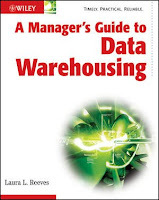 Laura has a new book out, which I highly recommend: A Manager's Guide to Data Warehousing. In this book, she provides a practical guide to planning and executing data warehouse projects. It is written for managers (I.T. and business) who do not necessarily have a technical background in data warehousing. Laura touches on each phase of the data warehouse lifecycle, providing useful advice without over-burdensome methodology, detailed task lists or the like. This makes it easy to fit her advice into your own organization's development style. Even if you already have a strong background in dimensional design, you will find this book to be quite useful. You can get it at Amazon.com. 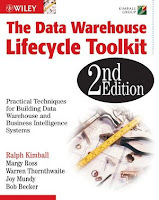 If you have a dimensional data warehouse, I also urge you to check out The Data Warehouse Lifecycle Toolkit, Second Edition by Ralph Kimball, Margy Ross, Warren Thornthwaite, Joy Mundy and Bob Becker. This fully revised version of the classic book contains detailed tasks and deliverables to help you manage all phases of the data warehouse lifecycle. It is an excellent reference for data warehousing professionals. Read more about it at Amazon.com.